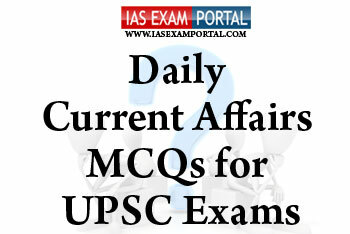 Current Affairs MCQ for UPSC Exams - 05 FEBRUARY 2019 | IAS EXAM PORTAL - India's Largest Community for UPSC Exam Aspirants. 1) PMEGP, a major credit-linked subsidy scheme since 2008-09, helps set up micro enterprises and to generate employment in rural and urban areas of the country. 2) The maximum cost of the project under PMEGP scheme is Rs.25.00 lakhs for service sector units and Rs.10.00 lakhs for units under manufacturing sector. 3) Under the scheme, women entrepreneurs are covered under Special Category and are entitled to 25% and 35% subsidies for the project set up in urban and rural areas respectively. Q2. Which of the following statements regarding the employment rules notified by ministry of labour with respect to employment of women in mining sector are true ? Q3. The central government has created a National Virtual Library of India (NVLI) to facilitate creation of a comprehensive database on digital resources of India on information about India in an open access environment. 1) Federated searching through multilingual user interfaces. Q4. Which of the following statements with respect to Indian Ocean Rim Association (IORA) are true ? 1) Indian Ocean Rim Association is an inter-governmental organisation and has many disaster-prone countries among its 22 members and nine dialogue partners. (a) To recommend and advice the central government regarding rail safety. (b) To recommend and advice the government with respect to frequent events of Man-Animal conflicts in buffer zones. (c) To recommend measures to enhance combat capability and rebalance defence expenditure of the armed forces. (d) To recommend measures to enhance the condition of small land holding farmers in the country.